Included in this listing for John’s library are several important works that exhibit methods on growing food crops, but also works devoted to pleasurable pursuits in ornamental gardens and landscape design. The Gentleman’s Recreation: the Art of Gardening Improved (1717) by John Laurence is an early book that likely illustrates John’s interests in the extravagant leisure gardens and fountains of a country gentleman. 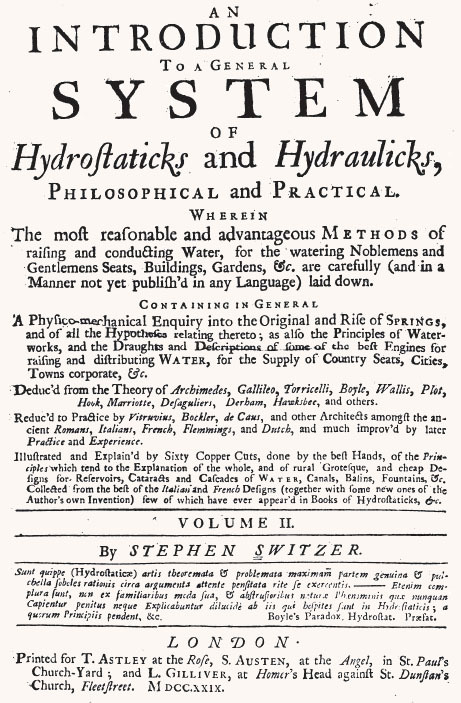 General System of Hydrostaticks and Hydraulicks (1729) by Stephen Switzer addresses the mechanics of water pressurization for such embellishments. Philip Miller’s Gardeners Dictionary (1731) and Kalendar (1732) were popular guides for growing plants for consumption, medicine, and profit. The use of a calendar system simplified the task of when to plant, tend to, and harvest in simplified terms which most gardeners, including John, might utilize to great advantage.